Crabgrass is the bane of any homeowner who wants an attractive lawn. If left alone, crabgrass can quickly spread and crowd out your regular turf grass. You can control crabgrass in a lawn, but you will need to plan ahead and be persistent. In order to protect those plants and grasses in your lawn that you want to keep, read herbicide labels carefully to ensure you're not applying a chemical that is harmful to them. Crabgrass is a type of grass, so most weed killers designed for lawns won't kill it. Fortunately, it is an annual, meaning that it dies during the winter and grows again from seed in the spring. The best way to kill crabgrass is to prevent the seeds from germinating. Apply a pre-emergent herbicide to the lawn in early spring to kill the crabgrass before the seeds germinate. Don't apply the chemical too early, however, or it will not be as effective. A good rule of thumb is to apply the pre-emergent herbicide right after the forsythia bushes stop blooming. If the crabgrass has already started growing, you can apply a post-emergent herbicide. Post-emergent herbicide will kill crabgrass when it is very young, but it may not be as effective on established crabgrass. Follow the directions exactly when you apply post-emergent herbicide or you may end up killing your lawn. Throughout the spring and summer, remove any crabgrass that emerges by hand or spot treat with a general herbicide. Use a brush to apply the herbicide directly to the leaves of the crabgrass so that it doesn't get on the surrounding lawn. 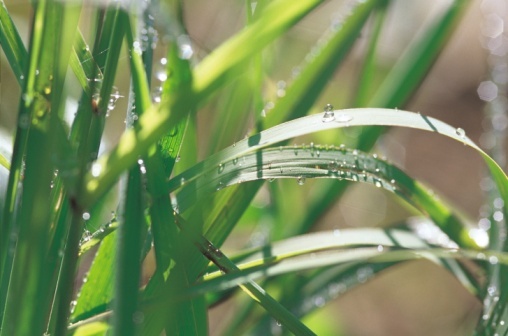 You can control crabgrass by making sure your lawn is thick and healthy. Mow your lawn at the highest setting to keep sunlight from reaching the seeds. Reseed bare spots promptly before crabgrass takes over. Deny the crabgrass nutrients while keeping your lawn healthy by fertilizing in the fall after the crabgrass has been killed by the frost. Water your lawn less frequently, but more deeply. Your grass has deeper roots so it can get the water it needs, but the shallow-rooted crabgrass will experience long, dry spells.